11Millennials have fewer attachments to traditional political and religious institutions, but they connect to personalized networks of friends, colleagues and affinity groups through social and digital media. 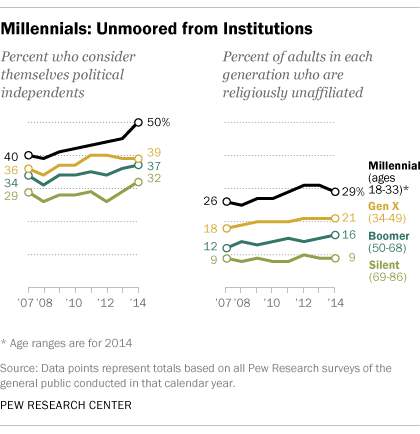 Half of Millennials now describe themselves as political independents and 29% are not affiliated with any religion—numbers that are at or near the highest levels of political and religious disaffiliation recorded for any generation in the last quarter-century. 22Millennials are more burdened by financial hardships than previous generations, but they’re optimistic about the future. Millennials are the first in the modern era to have higher levels of student loan debt, poverty and unemployment, and lower levels of wealth and personal income than their two immediate predecessor generations had at the same age. Yet, they are extremely confident about their financial future. More than eight-in-ten say they currently have enough money to lead the lives they want or expect to in the future. 33Singlehood sets Millennials apart from other generations. 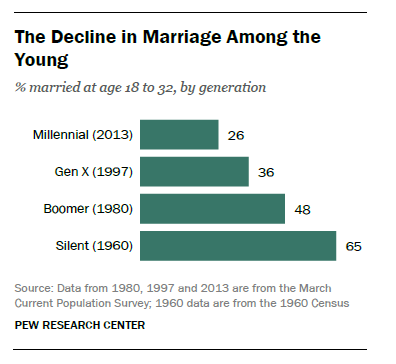 Just 26% of Millennials are married. When they were the age that Millennials are now, 36% of Gen Xers, 48% of Baby Boomers and 65% of the members of the Silent Generation were married. Most unmarried Millennials (69%) say they would like to marry, but many, especially those with lower levels of income and education, lack what they deem to be a necessary prerequisite—a solid economic foundation. 44Millennials are the most racially diverse generation in American history. Some 43% of Millennial adults are non-white, the highest share of any generation. A major factor behind this trend is the large wave of Hispanic and Asian immigrants who have been coming to the U.S. for the past half century, and whose U.S.-born children are now aging into adulthood. The racial makeup of today’s young adults is one of the key factors—though not the only one—in explaining their political liberalism. 55Millennials are less trusting of others than older Americans are. Asked a long-standing social science survey question, “Generally speaking, would you say that most people can be trusted or that you can’t be too careful in dealing with people,” just 19% of Millennials say most people can be trusted, compared with 31% of Gen Xers, 37% of Silents and 40% of Boomers. 66Few Millennials believe that Social Security will provide them with full benefits when they are ready to retire, but most oppose cutting current benefits as a way to fix the system. 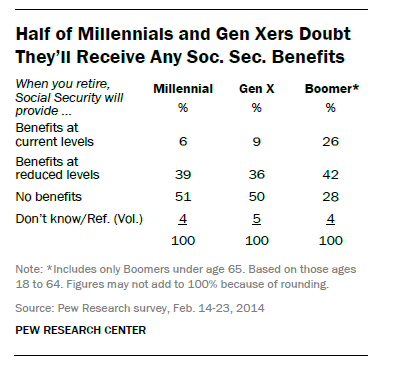 About half (51%) of Millennials believe they will get no benefits from Social Security and 39% predict they will get benefits at reduced levels. However, much like older adults, 61% of Millennials oppose benefit cuts as a way to address the long-term funding problems of Social Security.